This week I saw The Hunger Games movie. I haven’t read Suzanne Collins’s books and hadn’t really heard much about the movie, apart from the fact that it was incredibly popular, as are the books. The movie cinema was full of teenagers, unsurprisingly since the movie is about teenagers killing each other for blood sport. It wasn’t until the poor, working class Hunger Games contestants arrived in the capital to compete against each other (kill each other) that I cottoned onto the underlying theme of the story. It’s quite blatantly a story about what happens when social democracy fails. If you haven’t seen the movie or read the book, this observation isn’t giving the plot away. Very early on in the story, you learn that the nation of Panem (presumably a futuristic America) has been divided into 12 districts. This was done after the government squashed an uprising by the workers against oppression (think Occupy Wall Street), 74 years earlier. Since the rebellion failed, Panem has become an even more oppressive totalitarian state, and the inhabitants of the 12 districts live in poverty, without electricity, running water and in clothing that looks like it’s been around since the early 1900s. Each district has a different blue collar industry, such as coal miners, luxury goods manufacturers, stone and carving, fishing, electronics and transportation. The Hunger Games competition is run by the government, partly to entertain the rich people who live in the capital (called Capitol), and partly to punish to workers who were involved in the rebellion. A boy and a girl in each district are offered up for the games like some sort of sacrifice to the gods, or the capitalist pigs in this case. When the contestants get to the capital, it is like a different world from the districts they have come from. The buildings are futuristic, but also have a very fascist Germany feel to them. It might have just been me, but I felt like a Nuremburg Rally was about to begin. The people in the capital are blatantly rich – their clothing is ultramodern and very formal, like what you would call ‘couture’. They love watching the Hunger Games for entertainment and they all share a similar slimy, smug, joker-like grin. Like the cat that ate the canary. I’m not going to give away what happens in the movie, but suffice to say that I was 100% convinced that the story was a metaphor for the way in which the rich and powerful in our society (think the 1%), control and limit the power of the working class, for their own benefit. I thoroughly enjoyed the movie and I look forward to seeing the next two, and will likely read the remaining books. When I got home from the movie, I was interested to see if other people shared my view that the metaphor for the movie was a futuristic state where the 99% have failed in their uprising, and the 1% have extended the gap between their wealth and everyone else, to a point where the two groups are worlds apart. Clearly I see the world thought a very biased prism, and the political undertones of the plot screamed at me. The millions of teenagers around the world watching this movie are likely more interested in the love scenes. But I think the underlying themes will strike a chord for some people. Surely China is going to censor this movie! 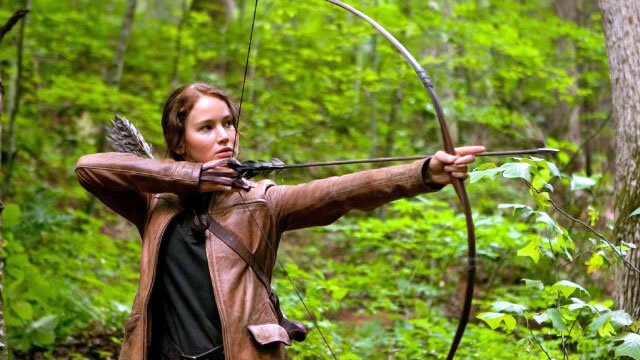 The ironic line that keeps ringing in my head when I think about The Hunger Games is one that is said many times to the contestants… “Happy Hunger Games, and may the odds always be in your favour”.